Nearly everyone that visits Thailand loves Thai food, and it is easy to understand why. Thailand’s abundance of herbs and spices make seasoning food easy. Additionally, Thais have mastered the art of blending these spices into masterworks of taste and texture. Spicy, sweet, sour, salty: every bite of a well-prepared Thai dish has a little of each. It is no surprise that Thai cooking courses are so popular among Westerners traveling here. Who doesn’t want to learn a little of this culinary magic to take home? Here at Khao Sok Riverside Cottages, we have our own twist on the standard Thai cooking course. 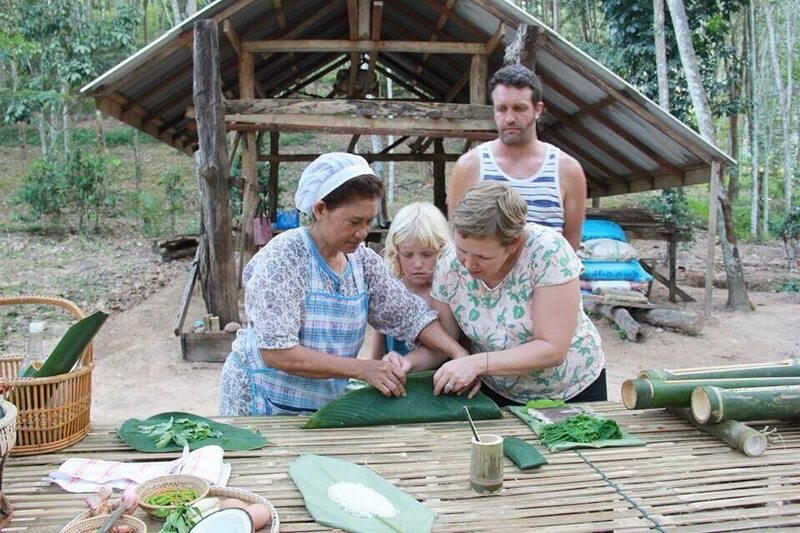 Here, deep in one of the oldest forests on the planet, our guests learn Khao Sok jungle cooking! Coming to Thailand, it is easy to forget that not many years ago, most of this country was almost completely undeveloped. In these times, the people living in Khao Sok survived with what they could grow and harvest themselves. 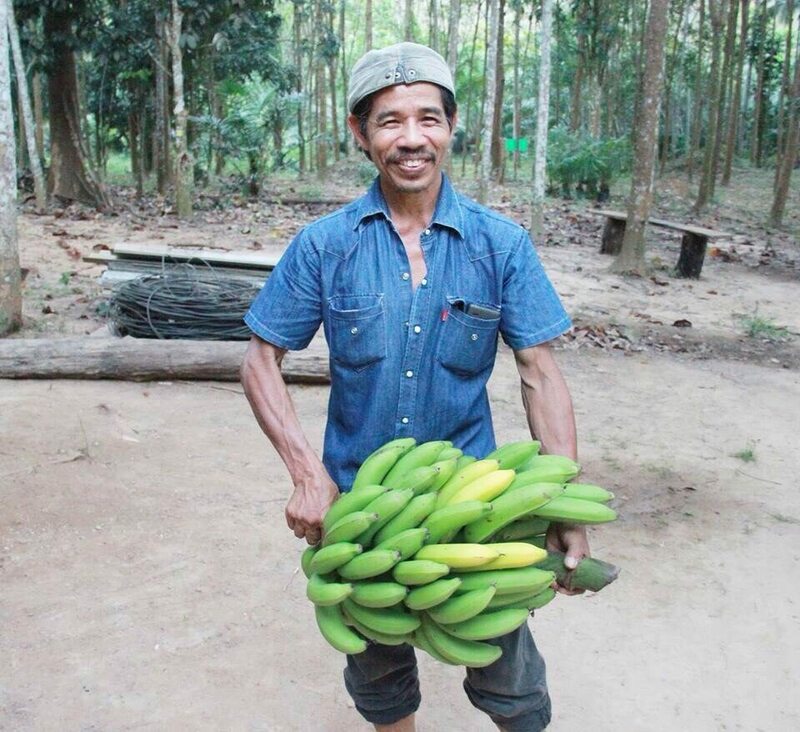 Banana and bamboo were some of the most abundant materials around, and locals used both in food preparation. 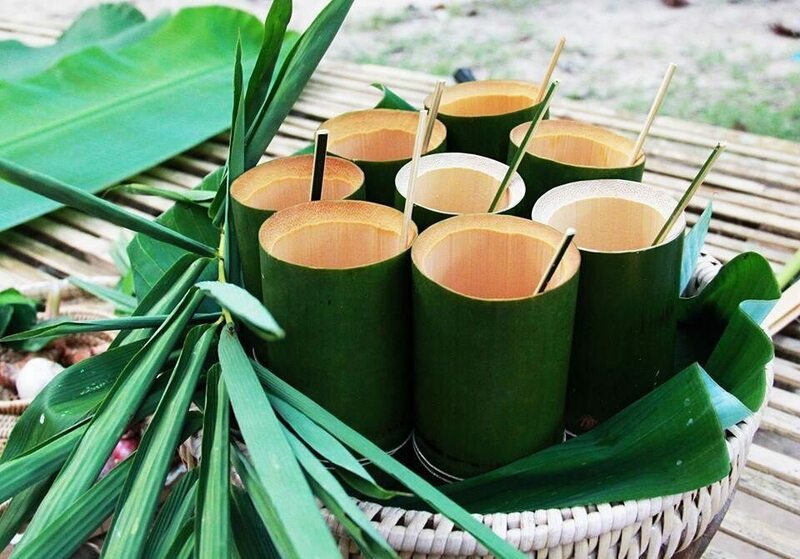 In our Khao Sok jungle cooking experience, guests learn the old ways of cooking with these natural materials. The Khao Sok jungle cooking experience begins as any good cooking class should. Specifically, with a market visit to learn about the ingredients that make up the meal. This is Khao Sok jungle cooking, however, so our ‘market’ is a farm nestled against a massive limestone cliff. Our guests pick vegetables and spices in the shade of banana trees. Our guide points out everything. We see tumeric, ginger, lemongrass, kaffir lime, galanga root. There is also eggplant, tomato, chili, and three different types of basil. Then, we learn about the different banana trees and how to tell them apart. Finally, our guide shows us the different types of bamboo and how best to use them all! He shows us how to identify and pick the best of each type of ingredient. Then, he harvests bamboo, and turns it into a pot for cooking! There are no electric rice cookers in Khao Sok jungle cooking! Instead, we spread uncooked rice over a banana leaf, add salt, and fold it tightly. Then we cram the whole thing green bamboo. Finally, the bamboo section is filled with water and placed over a fire. It leans close enough for the water inside to boil, but not so close that the bamboo burns. After 30 minutes, we dump the water out. Then, we replace the bamboo over the fire for another 30 minutes as the rice cooks fully. There is room over the fire for other bamboo pots, so we begin to prepare the next dishes. There is Gaeng Kiaow Waan – Sweet green curry, and Dtom Kha Gai – Coconut soup with Galangal and Chicken. Coconut milk is needed, so we learn how the process used to make that. We prepare our freshly picked herbs and vegetables, slice the chicken, and measure hand-made curry paste. Then we dump everything into the bamboo pots, along with some water, and lean them over the fire to cook. 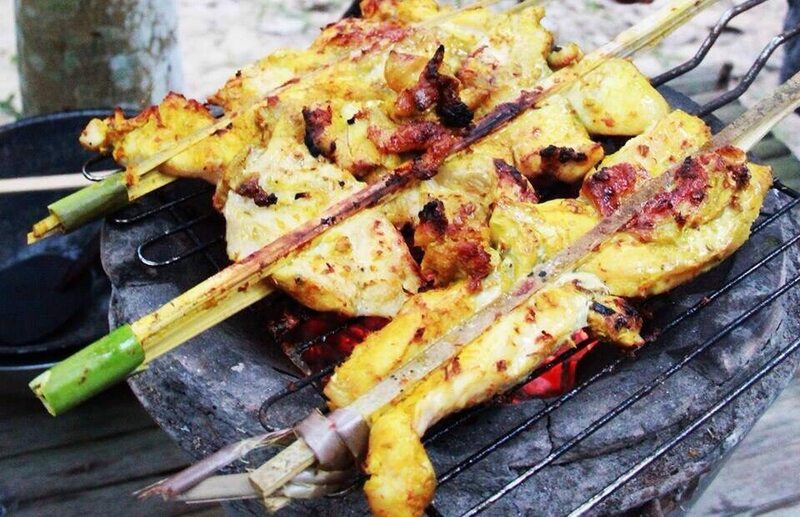 The next dish in our Khao Sok jungle cooking experience is grilled chicken! Thankfully, we don’t have to prepare the chicken, which is supplying all the meat for the evening meal. We watch as our guide secures the chicken with bamboo, seasons it, and lays it over the fire. Soon the smell of grilled chicken and turmeric blends with the unmistakable aroma of green coconut curry. My favorite part comes next. Specifically, the span of time where we all wait for the food to be ready. We stand around, chatting, and drinking fresh herbal tea made from lemongrass and pandanus leaf. Meanwhile, we enjoy the beautiful play of light and shadow on the cliff face above us. Soon the smell of food is almost overpowering. In keeping with the Khao Sok jungle cooking tradition, there are no bowls or plates. Rather, we eat curry and soup from ‘bowls’ made of freshly cut and cleaned bamboo. We lay the chicken on banana leaves. 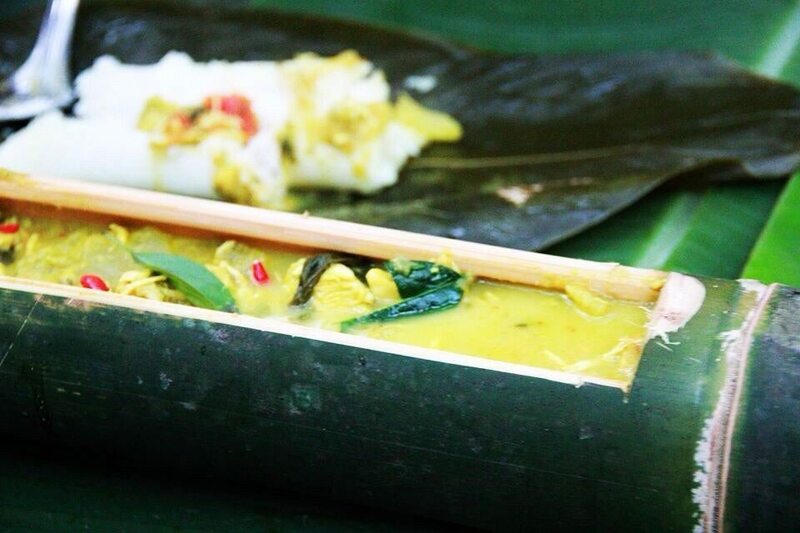 Finally, we unwrap the rice and eat it directly out of its banana leaf. The only things out of place are the spoons, which are shiny, metal, and store bought. This matters little to us, though, as we dig into our delicious meal. Flavors are clear and subtle. The tastes of vegetables, coconut, chicken and spices are expressed perfectly through the jungle cooking style. Nothing is overpowered by seasoning powder or MSG, and the fresh bamboo and banana leaf imparts freshness to every bite. My favorite is the rice. Wrapped in banana leaf, boiled in bamboo, the rice is slightly green when it is ready. It tastes amazing: Fresh, light, slightly woody…you can almost taste the green! We finish our meal as night begins to fall. The setting sun casts long shadows as we make our way back to the car. The drive back is quiet, save for contented sighs and a few quiet words here and there. The sights and sounds of the jungle still linger in our ears. The tastes of Khao Sok jungle cooking still lingers on our tongues. 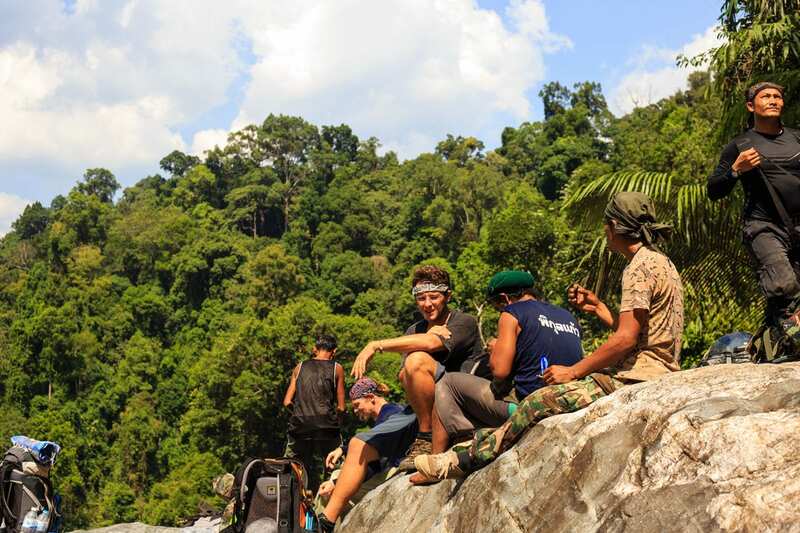 If our Khao Sok jungle cooking activity sounds great, then we hope you will join us in the Rainforest! This family is part of a larger network of community members working with Riverside Cottages to develop community-led, sustainable tourism in Khao Sok. They also offer a fantastic Khao Sok Elephant Retirement activity! For more information on community-led tourism in Khao Sok and southern Thailand, please click here! 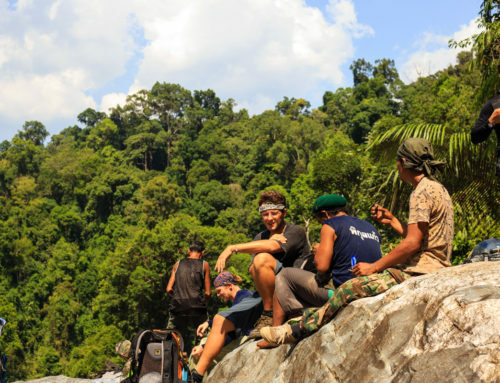 Find your perfect Khao Sok accommodation here, and dare to experience jungle life to the fullest!